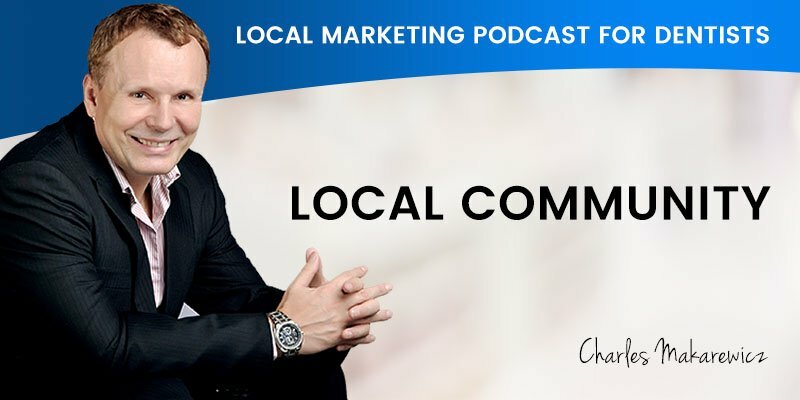 In this podcast, Charles yet again has provided great information and has given a lot of ideas about how dentists can engage with their local community. However, local community engagement is more than just participating in schools, sporting groups, charities or wider community events. It is how you use the experience of these events to create content and media for your online presence. All these add up to community credibility and authority both online and offline, and position you as the “Go To” dentist for your local area. Scott: I’m Scott Edwards and today I have Charles with me to discuss local community engagement and how it is an effective practice to demonstrate your commitment to your patients’ vital lifestyle and your community’s value to your dental practice. Charles is the founder of Dental Marketing Expert, a company which specializes in local marketing for Australian dentists and is responsible for many dental practices across Australia dominating their local competition and attracting up to 15 new patients each and every week. Scott: Charles, why is involvement with local community important for dental practice? Charles: I think that a lot of dentists will be a little bit sceptical at the beginning. Since we mainly operate in the online sphere, there may be some misconception about mixing online and offline. I think it’s very easy to answer. You are targeting your local community, local families. Your ideal prospect is a family who live within five kilometres from your dental practice. Now, your message could be put in front of them using an online and offline strategy. So coming back to your prospects, they also live in a community. They like to hear it, about local community. They like to know what’s happening. What’s the new event? Is there something else happening in the sport events? Whatever that is, they love to hear it. We talked to that on the previous podcast. When they think about the dental practice as a media company first and then a dental practice second. So what would media company do in the local sense? They will report on the local news. They will report on, let’s say a football event. And perhaps, as a dentist, you consider events like that and sponsorship of that event. So you can sponsor financially. You can also create a special offer for it, so let’s say guards or mouth guards for kids, 50% off or free, whatever your offer will be. It might get mentioned in the local paper. Could get mentioning online as well as offline, and additionally, pretty much all the football clubs will have a Facebook page. So you might get mentioned on a Facebook page. So you have some exposure. You might get some backlinks to your website. You might have a mention on the Facebook, so again, you might get linked to your Facebook. So this is really important. It builds that really good community. 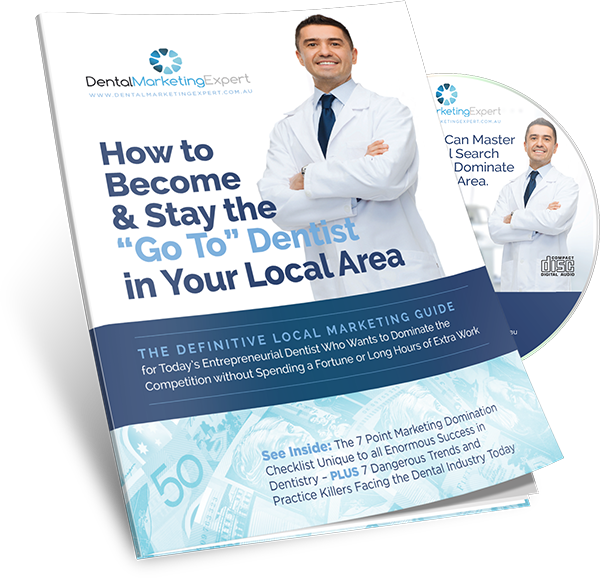 Everyone knows everyone, in a sense, so you’re becoming the go-to dentist, so you’re not their dentist yet, in a way, in their eyes, but more like a trustworthy person in their local community. So trustworthy go-to local community person. But that’s not far from go-to dentist. So they like you, and then they will basically discover that you are a dentist. They already like you, and we like doing a business with the people we like. So that’s sort of a long shot strategy, but it’s really effective. Other avenues to explore is your local schools. So having an evening event, approaching the schools and introducing yourself to the area and offering education evenings. So it could be at school. Perhaps not necessarily evenings, but at your dental practice, it definitely can be an evening, couple hours education. And that really goes well, targeting families. One and a half, two hours evening events are fantastic, and obviously, you don’t have to do them too often. You can probably do it every couple of months. So you can already create a 12-month calendar and say, “Okay, I’m gonna talk about this topic and this topic.” So it’s all about creating that local community calendar and see who you can be involved with. Now, there is one more thing I’d like to mention. It was any sports event that could be more of a regular event which are attracting the whole city. So for example, you have yearly event with the bicycle riding and things like that. And a really large community event. That’s really important, so it is local, but in a way, on the city scale. So you might have a representative from your local area, so perhaps you can sponsor one of the riders and the rider can be from your community. So if you are in Robina the rider is from Robina. And you’re sponsoring that rider, and that’s your name in there, and it’s Robina everywhere, which is the suburb and where you are. And it’s all over the media. All of it’s online and offline media, so this is really good exposure to get. I would look at what’s coming in the next 12 months and try to target those events and see something which you perhaps would be interesting in doing, and you can volunteer on those events, as well. So you can pay $200, $500, whatever the amount is to sponsor the rider, but you also can be a helper. You can volunteer at that event, as well, and have exposure there. Scott: So Charles, how does all this offline activity help you improve your rankings or your online marketing strategy? Charles: As I mentioned before, if you look at the media, a lot of coverage is done, especially if it’s a sports event. There’s also a lot of coverage from traditional media. So that’s easier for you to have your name up there, and having a backlink, let’s say from someone who have recorded that event in the video format or if it was article written and published. Or just a short press release and your name was mentioned. And if it’s an online and has a link back to your website, that’s really powerful for your rankings. And especially if it’s a backlink. Additionally, something which I haven’t mentioned was sponsoring charities, but let’s say donations to other things, like perhaps your church and being involved in there. So that can attract more visibility online, because pretty much all the businesses and all the charities, and a lot of others, they have a website, and they have a Facebook page. And if they mention you and add the link to your website, that straight away increases your visibility, improves your Google Maps ranking. There is nothing more powerful, to be honest, than really powerful local backlinks from your local newspaper. Now, as we looking at the summary of all the places and all the institutions you can be involved with, we can look at creating a monthly newsletter. So now you have so much written stuff, or perhaps some photos, and there’s definitely have enough information to create a monthly newsletter. Now, the monthly newsletter, it’s really good for online and offline. So first thing is you can print it out and simply distribute to your existing patients. You can have some at your dental practice as well. This is great thing to put online and have that in a PDF format and the downloadable file, and if you like, you could set up a very simple auto respond to capture emails to the database. This is a more advanced strategy. It’s not always recommended at the beginning, but for advanced clients, we will basically implement systems which are automated, in regards of email marketing and newsletters, as well as the reactivation campaigns. Now to summarize, this local engagement strategy ties up really nicely with the content marketing, because as you’re creating a content marketing for the whole year, you need to fill up those gaps. So you need to go and review your local community events, and what events are happening in the next 12 months. There’s a lot of information online. Go to Facebook pages and find that up and map that in and put this in your local calendar, and your yearly calendar for the content production. And additionally, you could be doing a lot of things locally. So if you have certain interests. So if you like photography, that’s not a bad thing to go with your camera in the local community and take some photos and you can post that on your Facebook. You can create a page on your website, on your dental website, which is called Local Community, or I Support Local Community. Or Supporting Local Community. Whatever you decide to have that named and what angle you want that to be. But at the end of the day, it’s a resource. It’s a page where you can put some best images. If you’re inclined to do some photography, that could have some images. It could be nature. It could be anything you like, which might be interesting to your local community. Additionally, there could be some mention of the local businesses. So you could have “My Top 10 Favourite Businesses in Robina”, and it could be the businesses you’re involved with, perhaps your local printer guy or your local computer guy, or maybe your florist. And your little grocery store. And you want to support them. They’re really fantastic, doing a great job. You can mention them all on your local community page. So this is where the transition starts, from purely offline to going online and promoting not just yourself, promoting other businesses in your local area, and joining the local community pages on Facebook and being active there. And then also mentioning, “Hey, I have a community page on my website, as well. Let’s start conversations. What do you guys think about? Is there any other businesses you think in the area, really worth it to mention?” You can create some prizes. There is so many things you can do. Just simply start the conversation and your community will get involved with you. Scott: Charles, yet again, you have provided some great information and given a lot of great ideas about how dentists can engage with their local community. But not only engaging with their local community, whether it be schools, sporting groups, charities, or wider community events, but how you use the experience of these events to create content and media for your online presence. All this adds up to community credibility and authority, both online and offline and positions you as the go-to dentist. Well, that wraps up today’s podcast, folks. Stay tuned for our next episode, when we discuss your reputation online and how managing your reputation is essential to your overall local marketing strategy.